Or, click on and complete the No Cost, No Obligation "Rental Application" and a CDI representative will contact you about availability. 8-Plex Units at $750 per mo. 12-Plex Units at $875-$925 per mo. Or click on and complete the No Cost, No Obligation "Rental Application" and a CDI representative will contact you about availability. If you are interested in getting a great apartment, please complete the no obligation "Rental Application" or contact Dan Terek at 608-539-2050 or e-mail him at dterek@couleedevelopment.com and we will contact you when a unit becomes available. 8-plex buildings with 2 bedroom 1 bath 932 sq ft. units with a 12'x22' detached garage with remote. Tri-zone AC/Heat systems that provide for comfortable and affordable temperature control. Large bedrooms and kitchen with dining area and laundry closet with washer/dryer hookup. New appliances include large refrigerator with ice maker, dishwasher and glass top stove with overhead microwave oven. These units also have large decks and off street parking. 12-plex buildings with more space, 2nd master bath, walk-in closets and upgraded Tri-zone AC/Heat systems that provide for comfortable and affordable temperature control. Larger bedrooms and open concept kitchen, dining and living room area. Also includes laundry closet with washer/dryer hookup. New appliances include large refrigerator with ice maker, dishwasher and glass top stove with overhead microwave oven. These units also have large decks/patios and attached garage with off street parking and water included. We have completed our 2nd 12-plex and the 3rd and final 12 plex is slated for completion in fall 2018. If you are interested in one of these or our other units or would like to be put on our waiting list, please complete the "Rental Application" or contact Dan Terek at 608-539-2050 or e-mail him at dterek@couleedevelopment.com. If you are interested in renting an apartment or taking a tour, please contact Dan Terek directly at dterek@couleedevelopment.com or call 608-539-2050. Just 15 minutes from La Crosse, Winona and Arcadia. 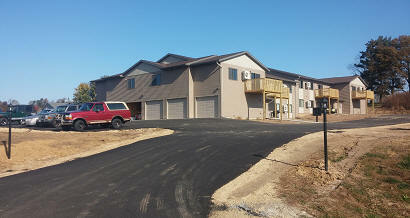 Click Here To Contact CDI and Reserve Your Apartment NOW or Call 608-539-2050!!! Coulee Development Inc. was founded in 2005 as a general contracting firm specializing in custom houses. But, with the housing downturn, we changed our business model to high-quality rental unit in 2009. 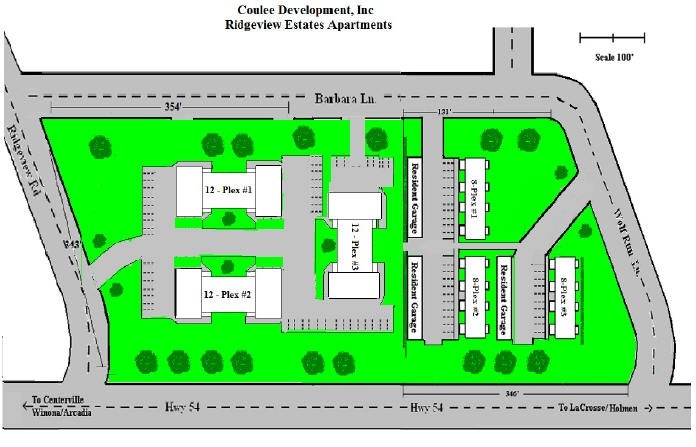 We have continue to expand our apartment inventor since and currently have 48 units in 5 buildings with a 6th due next year. To provide our tenants with a stress free, convenient rental experience by providing safe, modern housing with high end amenities at reasonable rates. We offer rental units to suit most budgets. We understand the difficulties when trying to find comfortable, safe, secure and modern living space for you and your family. With that in mind, we have built the most affordable housing possible, but not by cutting corners on construction or convenience. So call CDI today at 608-539-2050. At CDI we are dedicated to providing you with excellent customer service and excellence in everything we do. That is why we guarantee our tenants that we will do everything possible to ensure they have a satisfying rental experience with CDI.